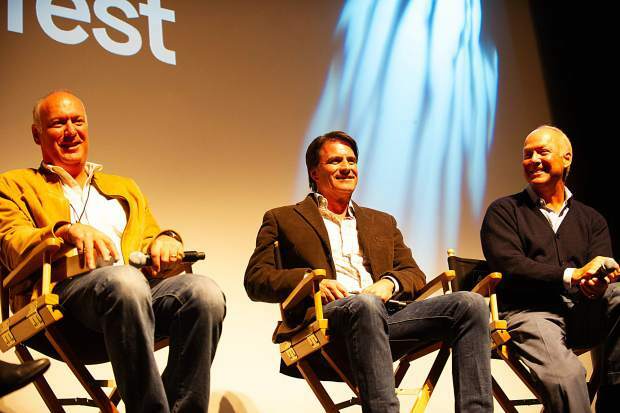 From left, Andy Godfrey, director John Breen, and Mark Godfrey on stage at the Wheeler for the Aspen Film Festival after the screening of the documentary “3 Days 2 Nights” about the brothers confronting the long-festering trauma of a 1974 plane crash that killed their parents and two siblings. When: Saturday, Sept. 29, 5:30 p.m.
Read the Aspen Times recent feature story on ‘3 Days 2 Nights’ here. A standing ovation greeted Mark and Andy Godfrey as they took the stage of the Wheeler Opera House on Wednesday night, after a sold-out Aspen Filmfest screening of the documentary “3 Days 2 Nights” about the brothers confronting the long-festering trauma of a 1974 plane crash that killed their parents and two siblings. The film was directed by the Godfreys’ lifelong friend John Breen, who joined them for the post-screening talk moderated by Aspen Film Executive Director Susan Wrubel. At ages 11 and 8, Mark and Andy Godfrey survived a horrific crash on their way to an Aspen ski vacation from Houston. The pair stayed alive in the wreckage for three snow-bound days on a mountainside outside of Glenwood Springs before an unlikely rescue. For nearly four decades that followed, they rarely discussed the tragedy privately or publicly. Andy broke his silence in a 2012 essay for the Aspen Times Weekly. He and Mark both open up and attempt to mend their frayed relationship in the film, which was five years in the making. The brothers hope the film can inspire others to open up and heal. “3 Days 2 Nights” is still a work in progress, but Breen wanted to bring it to Filmfest and make this hometown audience — which included longtime friends and classmates and family, including their sister Paula — the first to share it with Andy and Mark. It also will screen Saturday in Carbondale. “They had their three kids, and the three of us came in, and all of a sudden it was a family of six kids and total chaos,” he said. One touching section of the film depicts the folk singer John Denver’s visits to Mark and Andy in the hospital, singing songs with the boys as they were treated for their injuries. Asked about the Denver visits by an audience member Wednesday, Andy said that the Denver estate had been unaware of his relationship with the boys. Denver’s death in an aviation accident remains a haunting fact for the brothers. The film mixes footage of the Godfrey brothers today with idyllic home movies of the family before the crash. Emotionally raw and intensely personal, it brings the Godfreys back to the site of the crash — where plane debris remains — and to their childhood home in Houston. It reunites them with the boy who witnessed the crash from Sunlight Mountain and alerted authorities, along with the rescue pilot who plucked them from the wreckage. It also challenges the brothers to confront the pain and loss they’d largely hidden for four decades. The filmmaking experience, they said, was transformative.